Today, I would like to introduce a wonderful recipe called Guacamole-Stuffed Onion Rings. Crispy, deep-fried onions rings stuffed with creamy guacamole is everything you crave in an appetizer. 1. In a large bowl or mortar and pestle, add the avocados and mash into a chunky paste. Add the red onion, tomato, jalapeño, lime juice and cilantro; stir until everything is combined. Set aside. 1. Cut the yellow onions into 1-inch slices, pull out 15 to 20 rings and place onto a baking sheet lined with parchment paper. 2. Fill the inside of each onion ring using about 3 tablespoons of guacamole. Insert a cube of cheese into each ring and freeze for at least 30 minutes, or until solid. 3. In a shallow baking dish, whisk together the flour, cumin, paprika, cayenne, salt and pepper. Add the eggs to another shallow dish and then the breadcrumbs and crushed tortilla chips into a third dish. One by one, dip each frozen onion ring into the flour, then eggs and finally breadcrumb mixture. Store in the refrigerator until ready to use. 4. Heat the oil to 350 degrees F in a large heavy-bottomed sauce pot and fry the onion rings in batches until golden brown, crispy and warmed throughout. Transfer to a paper towel-lined plate and season with an extra pinch of salt. 1. Using a pair of tongs, roast the poblano chile over a gas burner until the outside skin is completely charred. Transfer to a heat-proof bowl, cover with plastic wrap and set aside for 15 minutes. Remove from the bowl, gently peel the skin and pull out the seeds of the pepper using your hands. Remember to wear gloves! 2. Add all of the ingredients to a food processor fitted with the blade attachment and process until smooth. Transfer to a small bowl, cover, and refrigerate until needed. 3. 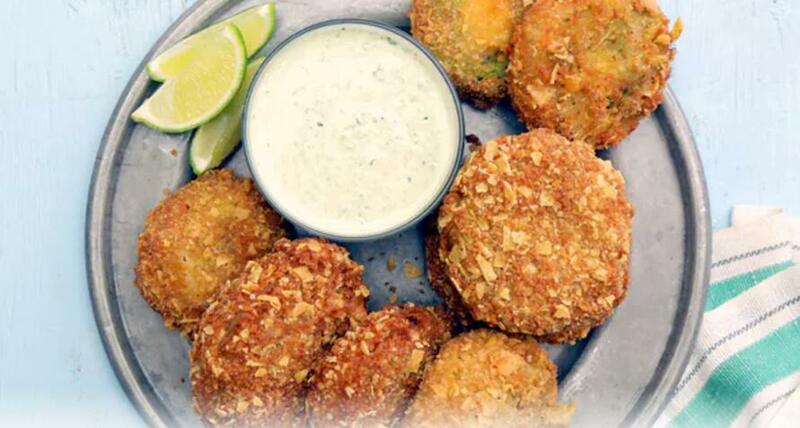 Serve on a platter with lime wedges and dipping sauce!